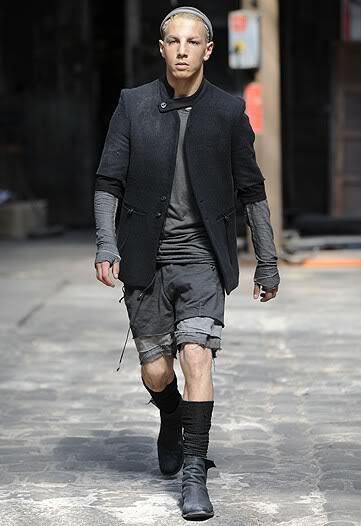 I liked the triple layering of greys with the shorts in this look. I was actually thinking of how good they would look for Autumn, as opposed to Spring, when paired with some grey knitted leggings. The raw hems of the two under layers was a detail I enjoyed, especially when considering how they would gently fray over time and with repeated wear. 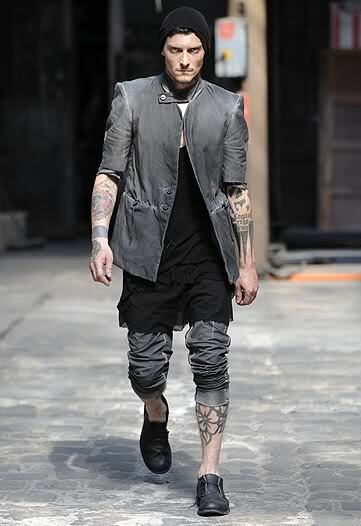 In fact for me they were reminiscent of those amazing frayed and destroyed Undercover jeans. The subtle variation of tones throughout the primary under layers, that of the shorts and long sleeve, really interested me. Absence of colour allows one to truly appreciate shape and texture, and here I found the intimate folds and creases of the garments against the body, so vividly drawn out by shadow, quite beautiful. In an everyday situation I think they would work nicely, being not so much about creating some loud expression (communication is where you expect the receiving end to both interpret and respond to your idea, whereas expression is more the outward display of some idea), but about understated detail and subtlety of thought. Once again the layering of greys really made this look stand out for me. 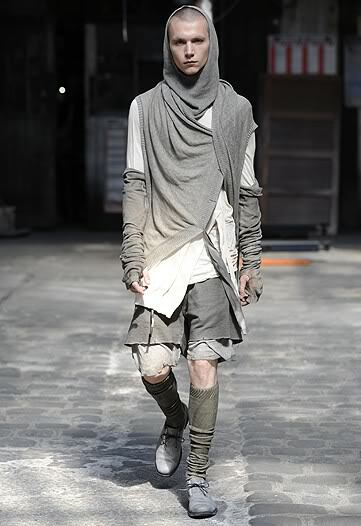 I found the tonal range and varying textures (note the subtle barred strips on the scarf) very alluring. I was particularly interested in the bright white seams of the cardigan, most noticeable on the out-swung arm, and indeed the curvature of that arm seam. I have actually been on the lookout for tops with thumbholes as of late. I think it most likely has to do with the comfortable memories of childhood and the practice of fraying the ends of my school sweater that pieces with thumbholes so strongly evoke for me. 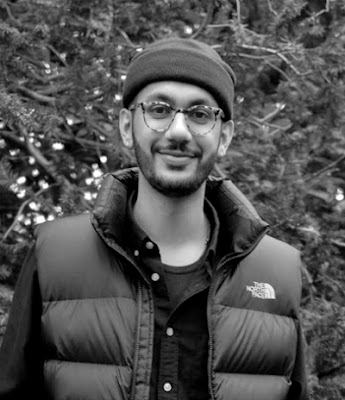 Comfort is something I think inherently important to my personal relationship with clothing, and as such it is one of the main aspects I appreciate seeing in fashion design. Indeed once these pieces are in stock next season, I look forward to trying them on and getting an actual worn feel of the garments and how they move. From what I have read Saberi used the cold dyeing process for some of the pieces in this collection, the results of which I believe are evident in this look. Essentially cold dyeing is a dyeing process using cold rather than warm water, which means that the pigment does not provide a uniform coloured finish, but rather allows for a unique uneven finish to the garment. For me that uniqueness is something I am drawn to, in that the garment bears a trace of the construction process through this use of cold dyeing. Considering first the creative design process, and then evaluating the finished article, it can often be all too easy to overlook the actual skill and wonder of construction that goes into a finished garment. Whilst it is something which needs to be viewed in person to gain a full appreciation of, the idea of using a process which specifically allows for a trace and memory of that very process is something I really do appreciate. This webbed sweater is beautiful. I would love to own a dip-dyed version transitioning from pale grey to black. Whilst I could have done without the head wear, I loved how easy and relaxed this look was. 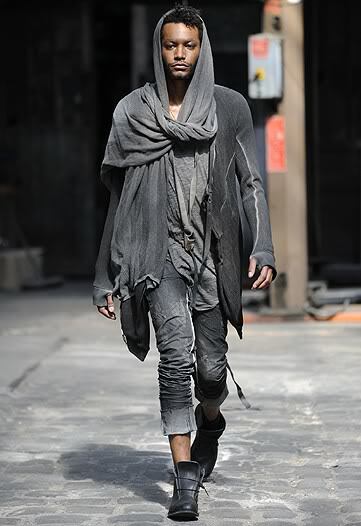 I could quite happily see myself wearing this look, albeit perhaps with something like the black leather sneakers from Silent by Damir Doma, as opposed to the grey unlaced boots. 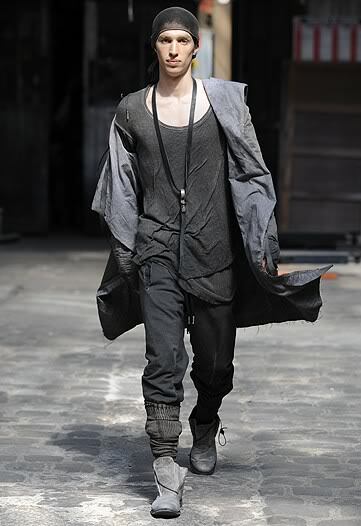 Oh, and an Ann Demeulemeester feather necklace instead of that leather piece. Whilst I admit that this is very busy look, I think breaking it down to the individual garments there are a lot of strong pieces to be found. Once again I love the layered shorts and how they work against the long, almost dirty grey, socks. The long grey arm sleeves are also something I really like, especially when considering the potential to style them on different outfits. 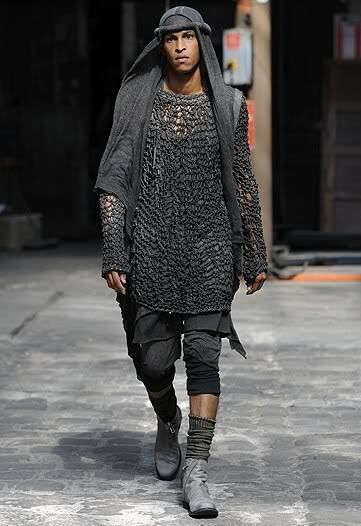 Indeed I think they would add a nice flair to the (relatively) basic Boris Bidjan Saberi raw hem longsleeve. I really would like to find out who produced the footwear for this collection, because I found these grey lace ups really beautiful. I have said before that I personally avoid wearing white trousers, and this is no exception (although it does undeniably work with the look), however I am really intrigued by what is happening in the upper half of this look. 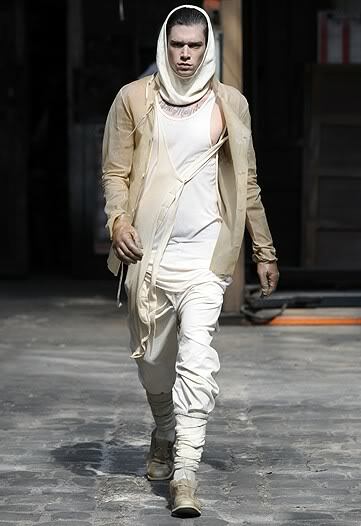 First we have the tailored white leather jacket with the slit elbows and asymmetrical zipper. I find the slit elbow rather charming, and am imagining wearing the jacket atop, say, a black rayon long sleeve, and how it would look when the arm was bent to reveal that under layer. The fall away cardigan also works nicely against the curved hem long sleeve, and I really like the subtle variation in shades. Indeed one of the greatest strengths of this collection in my eyes was the clever and complex use of tonal differences and textures, it really does make for an exciting albeit subtle finish to each look. I loved the layering in this look, especially the effect of the lower half, however what really caught my eye was the use of transparent leather for the jacket and gloves. Whilst various treatments and types of leather are employed with a great frequency in fashion, from blistered lambskin to reverse horse hide, the idea of transparent leather really intrigues me. Conceptually I suppose it quite literally becomes a second skin, reminding me of when you peel away that first epidermal layer - soft, elastic and translucent, but quickly drying and turning white. In a curiously similar way the stress points of this jacket would slowly turn a soft white, so viewing the garment in an evolutionary process would be fascinating. Whiskering and creasing is particularly vivid where leather garments are concerned, but adding such a highly contrasted change - that of turning from softly translucent to a thick milky white - here I find the use of the transparent leather really rather amazing. 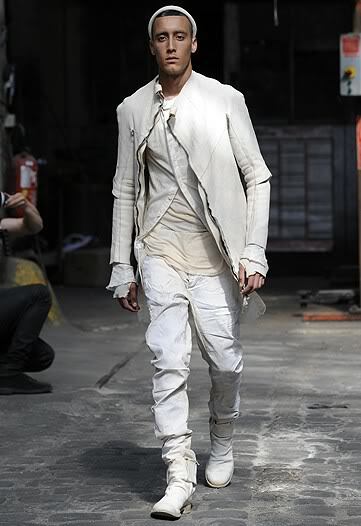 Considering the idea of this transformation occurring so intimately against the body of the individual wearing, I do wonder how different this look would have been, particularly the jacket layered over the white pieces, were the jacket to have been broken in rather than pristine. In a way I suppose it alludes to the life of the piece beyond the runway, allowing it to become an intimate representation of the individual. so rugged urban. love the gray. I would love that gray scarf! Great post. I love these designs - I'm such a fan of layering, and these do it to perfection.